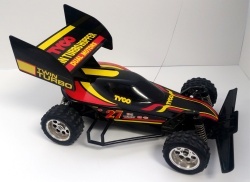 Love the look of the Tyco Buggy. 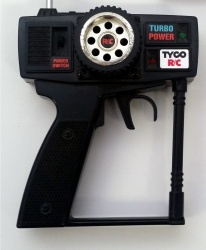 I have heard that vintage there are some vintage tyco RC that have things that how they need trigger throttle turn. Question I have is about the remote and turning. When driving the RC do you need to pull the trigger on the remote while twisting the remote wheel for the Buggy to turn? Hi Jimwheels22, First of all, welcome to the forum. I'm assuming that this Tyco vehicle is the same as others that I've played with in that you are able to twist the wheel independently from the throttle, but twisting the wheel alone won't generate any forward or backward movement - you'd already need to have some momentum if you're expecting to release the throttle. If the reason for your question is in consideration of single-handed-control, I do remember trying this with one hand before, using my thumb to twist the wheel while keeping my finger on the throttle. I personally found the pistol grip controller easier to use single-handed than trying to use the traditional box style (two-stick) controllers in a single-handed fashion. I may have had an injury that kept me from using my other hand at the time, I don't remember specifically what the reason was, so I don't have extended experience with this.